OXFORD, Miss. — Ole Miss prepares to take on Arkansas in Little Rock this weekend, and head coach Matt Luke and the Rebels took to the practice field Tuesday to get ready for the Hogs. The staff and players, coming off a blowout victory in the Vaught over ULM 70-21, feel good about the direction the team is going on both sides of the ball. As focus shifts to the Razorbacks, here are a few items of note. Arkansas is coming off of a 65-31 loss at the hands of the Alabama Crimson Tide. The defeat drops the Hogs to a disappointing 1-5 overall record and 0-3 mark in the SEC. 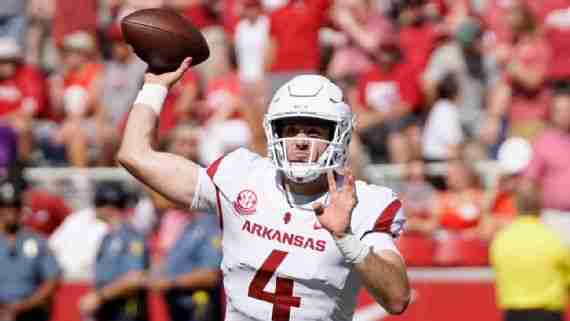 Junior QB Ty Storey, who has started the last three games for the Hogs, is coming off a 230-yard passing performance against the Tide. Arkansas enters the game in 12th place in the conference in total offense, with 357 yards per game (211 passing, 146 rushing). Defensively, the Hogs allow nearly 405 yards of offense per game which should bode well for an Ole Miss offense that is coming off a school-record 826-yard performance. Overall, the Razorbacks and their first-year head coach, Chad Morris, will be looking to get the season back on track this coming weekend as they try to transform the team into a more pass-focused attack, while still heavily incorporating the rushing attack they have been known for over the last several seasons . To counter Arkansas’ newfound passing attack, along with their consistent rushing attack, Ole Miss defensive coordinator Wesley McGriff and his Landshark D are preparing themselves to be disciplined throughout the game. “It will be a football game where they test our rules and how well we are adhering to our keys,” McGriff said. At Tuesday’s practice, Tylan Knight and Armani Linton were seen taking significant snaps with the first and second team defenses. Both players moved from running back to defense the week of the ULM game in order to help shore up a unit plagued with the injuries. The progress of the two was very noticeable in the win over ULM as Linton and Knight each contributed on multiple impact plays. Linton finished the game with 6 tackles, 4 solo, 1.5 TFL and 1 quarterback hurry. The junior also picked up his first sack of the season. As for the true freshman Knight, he notched 3 tackles, 2 solo, .5 TFL and 1 quarterback hurry against ULM. For those wondering how crowd noise is prepared for in today’s college football–at Tuesday’s practice head equipment manager Ken Crain placed several loudspeakers onto the field. They were moved 10 yards behind Jordan Ta’amu and the offense, blasting the sounds of the Arkansas Razorback fight song, something the Rebs will surely hear Saturday in War Memorial Stadium. Another thing to note from practice, for those interested in the aesthetics of the game, the Rebels were seen wearing their new white helmets at Tuesday’s practice, perhaps signaling a possible appearance in this week’s game. The Rebels will look to improve to 5-2 on the season, as they head into the six-game gauntlet of SEC action that could help set the tone for the second half of the season. Kickoff is set for 6:30 p.m. (CT), and the game will be televised on the SEC Network.